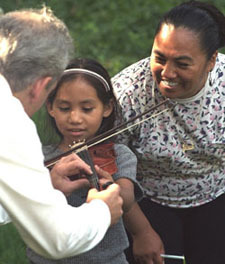 Children receive an Introducing The Orchestra coloring workbook and learn to identify members of the different instrumental families and how these instrumental families produce distinctive sounds. 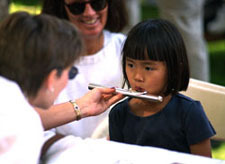 The activity also offers children an opportunity to handle and "play" musical instruments under the guidance of orchestra members. Violins, Flutes, French Horns, Trumpets, and percussion instruments are provided by Sam Ash Mega Music Stores.